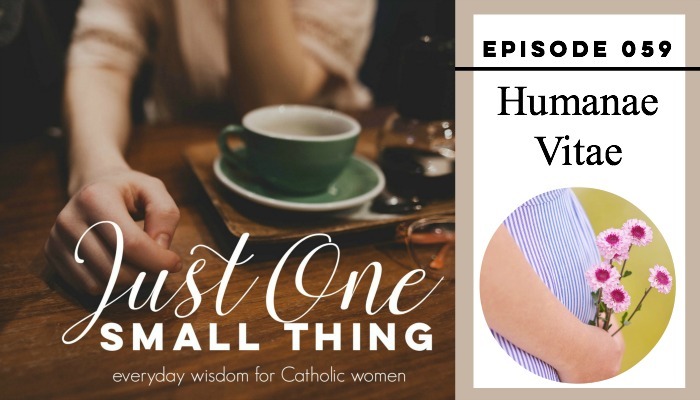 Today we are talking about the Catholic Church’s teaching on Miscarriage. There has been a LOT of confusion on this point, and with the help of this GREAT BOOK written by two wonderful friends, Grieving Together (find it here: https://amzn.to/2MgFnO0), I work hard to answer some of those questions. 1. Can we baptize our baby? 2. Can we name our baby? 3. Can we bury our baby? What do we do if we don’t have the baby’s remains? 4. Is my baby an angel? A saint? 5. Is my baby in Limbo? Heaven? 6. Is there a funeral or burial rite we can use? I hope this information brings you comfort during this time of grief. I have been through 2 miscarriage and 1 stillbirth loss, so I know how hard this time is and how hard it can be to find some of this info. And please consider joining us on Facebook! We Catholic parents need each other, so come and join a group where we can talk about raising saints, what is means to be Catholic and life as a Catholic! 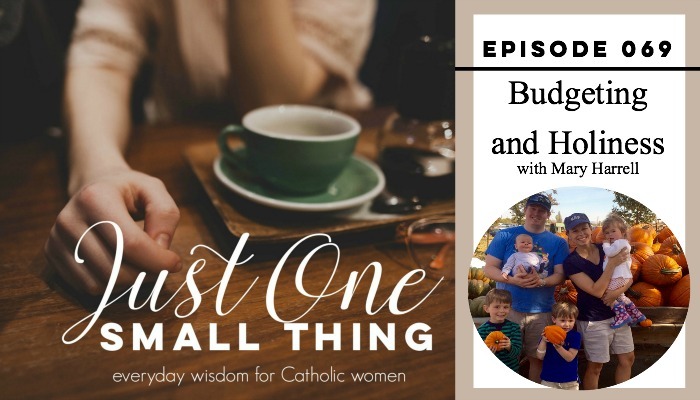 I just love sharing wonderful Catholic ladies with you here on the Just One Small Thing Podcast, and I have another great one for you today! Sterling Jaquith is on today’s podcast, and if you don’t already know and love her, you will after this episode! 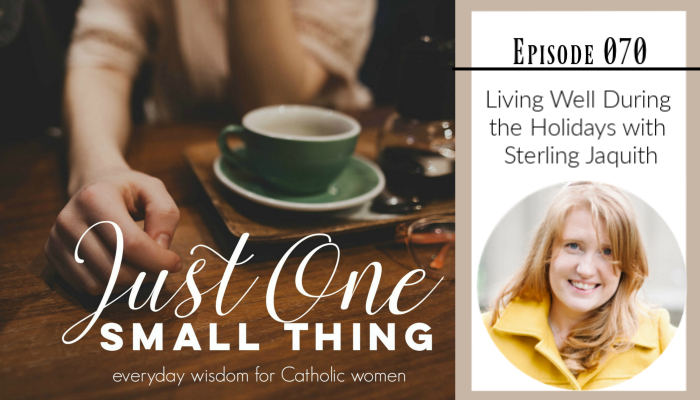 Sterling is passionate about helping Catholic women in a variety of ways. If you aren’t already listening to her podcast, Coffee and Pearls, then you should start. It’s great! 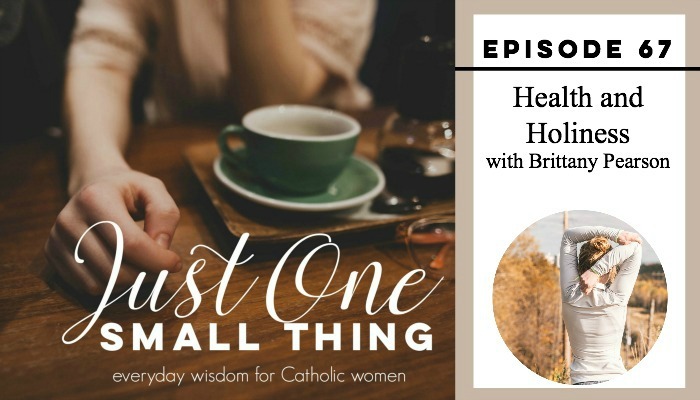 Sterling also runs a THRIVING Facebook group to help Catholic families embrace minimalism and leave chaos behind, she works closely with up-and-coming Catholic female business owners, and she has a wonderful resource for all of us as we head into the holiday season. Because, while the holidays are a beautiful time, they can also be a very stressful time, and a hard time on our marriages. One of the most powerful things that Sterling said in our conversation, which I’m sure you feel is true, is that the devil loves American holidays. He loves how wrapped up in *things* we get–things that aren’t God. He loves the materialism, the stress, and the way our relationships can suffer. Sterling digs deeper into each of these concepts in her book, Be Merry and will be helping women prepare for the holidays with her Holiday Training Workshop, which will be held on November 15th, 16th and 17th. I really think that we ALL should consider signing up and attending this training. Wouldn’t it be amazing to stay focused on GOD and FAMILY this holiday season, and actually enjoy it? I hope you find a lot of value in this episode! As I mentioned in the episode, I also have some great resources for Advent and the coming year available right now! Check them out! Hey friends! Welcome back to another episode of the Just One Small Thing Podcast. I hope you have been enjoying all of the wonderful ladies that I have had on lately. It has been so much fun chatting with them all and tapping into their unique wisdom! I have another great lady to share with you today, and I have a feeling that her message will be as challenging for some of you as it was for me! Mary Harrell from Domestic Apologist is here today to talk about…budgets. I know…ugh, budgeting. When Mary brought this up as the topic she would like to talk about, I thought, well, okay, if you really want to. If you are like me, you get that budgeting is important, you do it a little bit, but would never deliberately go out of your way to learn more about it! Well, Mary challenged me on this point, and I bet she will challenge many of you as well. In the episode, Mary shares how she met her husband (really good story) and how they ended up needing to seriously budget. Because of the circumstances, he was able to convince her to take Financial Peace University and, according to Mary, what they learned in that course allowed them to not only buy the house they wanted, but have a better marriage and live better. It’s really inspiring! In this episode, we also talk about tithing, communication, the specifics of successful budgeting, and lots of other great topics. Once you are done listening I encourage you to connect with Mary at her blog! Also, as I mentioned at the end of the episode, my Marian Themed Liturgical Planner is on sale right now! I didn’t order as many as last year (when I sold out) so if you want one, go get one! Check them out here: Marian Planner Liturgical Planner. I hope you are enjoying the Virtues of the Rosary series we have been doing around here, but since we finished up the Sorrowful Mysteries last week, we are going to take a little break before diving into the Glorious Mysteries. So, it is the perfect time to introduce you to a couple of wonderful ladies with truly beautiful missions. First up, today’s episode features Brittney Pearson from Fit Mom Life to the Fullest. And Brittney has a message that is challenging for many of us (ME!). She challenges us to accept that fact that our heath and our holiness are linked. Brittney is a young mother herself, so she knows that we can be fit, even during these baby years. She also really believes that busy moms can find time to be fit and healthy. It will take discipline (mortification–it’s a virtue! ), but it can be done. The key, she says, is to clearly know your WHY when you are working out. Are you doing this just to be beautiful, or are you doing this to honor your husband and your family–and ultimately your God who created you. Brittney has taken fitness seriously for a long time. At one point, before marriage, she fell into an unhealthy fitness obsession, but she came out on the other side of that and now she can see more clearly the proper place for fitness in our lives. For many of us, we just need to hear the reminder that fitness deserves a place in our lives, especially after all of the bad habits we (I!) have acquired through years of pregnancy and breastfeeding. More than anything, Brittney reminds us that we need to not only be good stewards of our souls, but we also need to be good stewards of our bodies. I hope you are well, my friends and thank you for all of your support! Ready for a beautiful, meaningful episode? Well, Lizzy Grayson, a mom of little ones, practitioner of NFP and fellow podcast listener delivers a beautiful, little episode for you today! A few weeks back Lizzy emailed me asking if I would consider doing an episode on Humanae Vitae. Sure, I said, if you come on as a guest and share about it! You see, I read Humanae Vitae in college…a million years ago, and Lizzy said something so interesting–she said that this Papal Document had profoundly impacted her and her husband. This surprised me because I have heard LOTS of couples talk about how Theology of the Body impacted their relationship, but Humanae Vitae? Well, after listening to Lizzy I bet you will feel the beauty of the document as well. Humanae Vitae came out in 1968 and was written by Pope Paul the 6th as a response to the widespread use of contraception. Many Catholics argued that the pill should be okay for Catholics to use, but the Pope clearly stated that since contraception make the marital act no longer unitive and procreative, thus changing this sacramental act, it went against church teaching. We can see now just how prophetic Humanae Vitae has been. In this short encyclical Pope Paul 6th predicts that widespread use of the pill will lead to increased infidelity, it will be forced on women and women will be respected less. The church, however, remains compassionate for Catholic couples. It acknowledges that not being able to use contraception is a cross to bare. It also encourages us to grow in temperance and charity, which we have a greater opportunity to do when we don’t use contraception. It really was a wonderful and powerful conversation with Lizzy. If you are listening to this and upset by anything we said, please feel free to reach out to me via email. I would be happy to chat with you about it. Also, please don’t feel condemned by anything we said here. We are all sinners and if you have failed to live out fully the church’s teaching on contraception, please, do not despair! Thankfully, there is forgiveness for all of us, for whatever we might have done! Believe in that and bring these things to the Lord! You can read Humane Vitae online for free, right HERE. You can also read all of Casti Connubii, an encyclical written by Pope Pius the XI and mentioned by Lizzy in the podcast, online for free. Find it HERE.